Come Out and See Us at the Gun Show! If you live in the Southern Wisconsin region, we have some exciting news! The Wisconsin Firearms Coalition will be coming to the Janesville Gun Show, January 20th (Friday) and January 21st (Saturday). The show is being held at the Rock County Fairgrounds, which is located at 1301 Craig Avenue, Janesville, WI. This is one of the largest gun shows in Southern Wisconsin and it’s always well stocked with guns, ammo, gear and more. The Wisconsin Firearms Coalition will be out there Friday from 3-8pm, and all day Saturday. Please note, we will not be there on Sunday. I hope you’ll stop by and get involved in our push to advance Constitutional Carry law by signing the petition. While you’re there, you can join the Wisconsin Firearms Coalition and pick up a free T-Shirt! So, if you’re in the area, be sure to stop by and say hello! 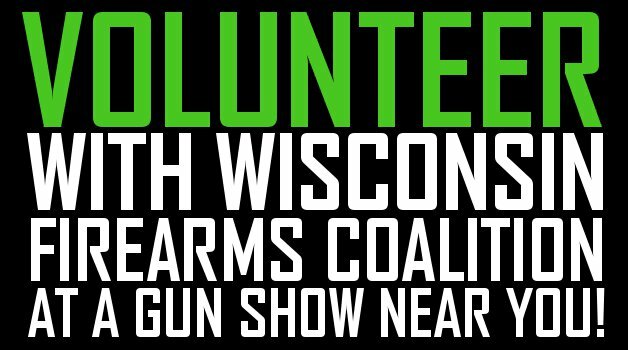 >>> In addition, if you’d like to volunteer during this show for a 4-hour time slot, the Wisconsin Firearms Coalition will pay your admission to the show, and give you a free WIFC T-Shirt! P.S. The Wisconsin Firearms Coalition will be at the Janesville Gun Show this weekend, on Friday and Saturday! Come on out and get involved in our fight to advance Constitutional Carry law for Wisconsin’s gun owners! And if you can volunteer for 4 hours, we’ll happily pay your admission to the show — and make sure you leave with a free WIFC T-Shirt. Click the link here to get involved. Don’t forget to sign the petition for Constitutional Carry while you are there!